We have been so busy the past few weeks! I am also guilty of....disposables....until yesterday I had the same diapers drying on the line that have been there for close to 2 weeks. Bad! They were also piled underneath yards and yards of fabric!! I have been sewing like crazy getting ready for the Momstown Birthday Bash which is in just under two weeks. I may be MIA until then with just a post here and there. I'm skipping the diaper series this week and last week and probably next week because I haven't been able to take any pictures of Emmett wearing them. I'm hoping to have the new Glow Bug diaper review done soon! So, why am I posting a picture of part of our stash today? This post isn't about creating a start up stash. It is to remind you to do your own research. Find what works for you. When I first started our stash I read reviews, did research on companies and materials, various systems (AIO, pocket, prefolds, etc) and chose the CD and accessories and wash products and routines that I felt would work best for our family. We did go with a lot of mid/high end diapers. We are fortunate that we were financially able to do so (one of the reasons a lot of families choose to CD!). We have been very lucky that this research and purchase of high quality products paid off and we have had very few problems. 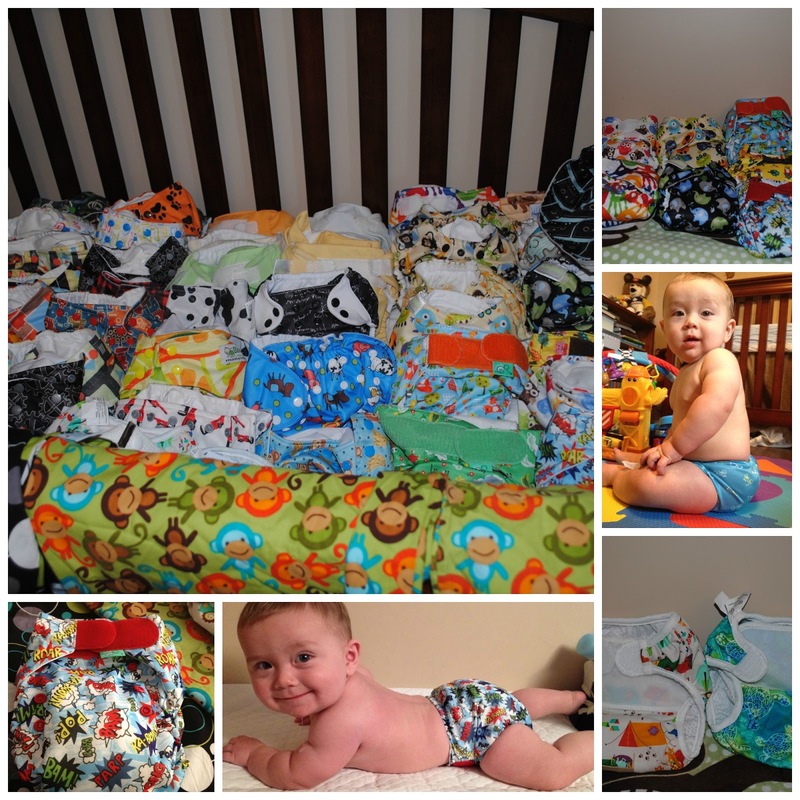 There are only a handful of diapers in our 75 + diaper stash that we don't like. A few weeks ago I gave my input to a local Mom via the world wide web about starting up a stash. Opinions on the brands I like, use, don't use and reasons why. My suggestion as it is to anyone wanting to start out is to get a few different brands and see what works for you and your baby. I was bothered by another comment suggested that this Mama should purchase a starter stash of a few low end brands (they were named but I won't rename them here because I personally don't use them - research and friends opinions led me away). Just to see if they liked CD because there was no point putting out the money only to not like it. Just to see if you like CD....personally had I ONLY purchased low end diapers that were prone to leaks, repelling due to lower grade materials and poor fit...I probably wouldn't be using them anymore! While I think there are some great low/mid end diapers to start out with you may not be one of the lucky ones to have a good experience with them. Don't let start up cost have you running out of the store. Think of the long run savings! That being said. What worked for our family may not work for the next family. It might work great for another. I KNOW it won't work for some families too. Everyone's experience and needs will be different. Just like everyone's baby is different!